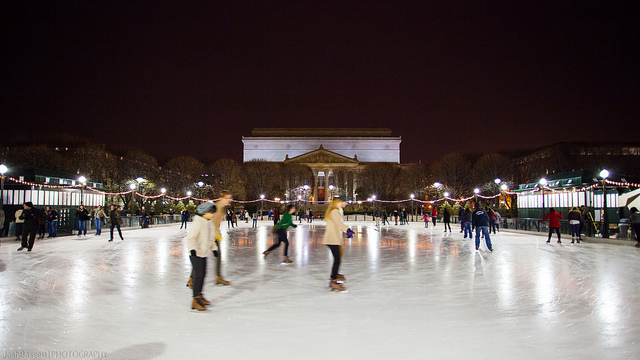 “During evening ice-skating hours, when the National Gallery of Art is closed to the public, the surrounding Sculpture Garden is also closed. Access to the ice-skating rink and Pavilion Café during these times is restricted to the Constitution Avenue and Madison Drive entrances at 9th Street. The 2015–2016 ice-skating season begins November 14 and continues through March 13, weather permitting. Experience ice-skating in the Sculpture Garden while surrounded by large-scale sculptures by contemporary artists, including Louise Bourgeois, Sol LeWitt, Tony Smith, Roy Lichtenstein, Roxy Paine, and others. January 1. Please note the ice rink will be closed when it rains or when the temperature dips below 20°F. Annually, mid-November until March, The Washington Harbour Ice Rink transforms from its interchangeable use as a picturesque fountain and is open for recreational skating every day, including all holidays. Join us for our weekly skating events!